There is nothing more vivid than the memory of the first time we meet someone. The first thing we remember about them? Their smile, of course! Before even speaking a single word, it’s the first thing we start to take notes on. Is it big and bright? Is it white? Is it not? Before a person even has a chance to light up the room with their words, their smile lights it up for them. It goes without saying, someone’s smile is worth a thousand words. Don’t let smiles make or break a first-time interaction. That’s right, don’t just think about lighting up the room. Actually, go ahead and light up that room — with a perfect smile, of course! According to nearly 4,000 reviewers, this system is the simple trick to perfect pearly whites! See it: Grab the AuraGlow Teeth Whitening Kit, LED Light (originally $60) now only $49, available while supplies last at Amazon! Please note, prices are accurate at the date of publication, March 24, 2019, but are subject to change. The AuraGlow Teeth Whitening Kit, LED Light system is the ultimate teeth whitening system. From the comfort of our home, users can now take their teeth to the next level with one simple system. That’s right, this can help make teeth whiter and brighter practically overnight! With one carefully crafted tiny kit, it includes all of the products required to make teeth their brightest and whitest yet. The included mouth trays require no molding or boiling prior to use like some teeth whitening kits, but this system is totally customizable. How so? Simple! Instead, this tray will fit mouths and allow users to whiten both the top of their teeth and the bottom of their teeth at the same time. Talk about multi-functioning at its finest! In fact, this teeth whitening kit looks to be multi-functional in the shortest amount of time possible, too. The LED light contains five bulbs for the most power possible and a built-in timer that will beep when it needs to be removed. All users have to do is simply place the product into their mouths, press the power button to turn the light on, and then let it sit for 30 minutes. The beep feature is in fact, one of the best features. This LED light will automatically turn off and beep in 10-minute intervals for just about everyone’s own convenience. Users can use this comfortable system comfortably. The beeper reassures everyone that they will not over- or under-use this product. Making this system so easy to use, the kit also includes two 5mL teeth whitening gel syringes containing 35% carbamide peroxide and a total of 20 whitening treatments. When using this comprehensive kit regularly, once a day for 30 minutes straight, it’s expected that users will see a gradual difference. Gone are the days of all of that coffee, wine, soda, tea and/or smoking stains! Nothing but pearly whites from here on out. Across the board, this teeth whitening kit wasn’t just revolutionary to Us. 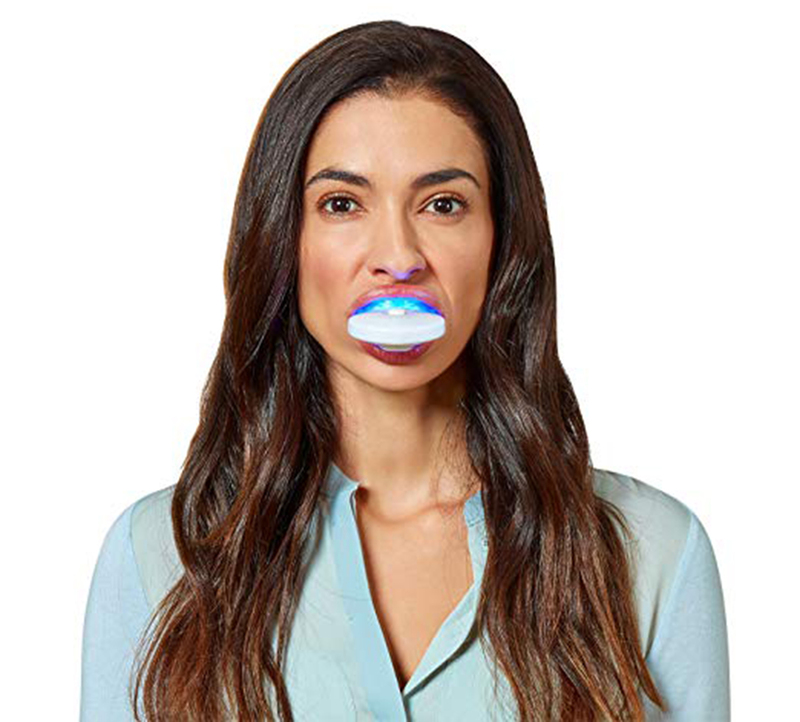 No, this teeth whitening kit was life-changing for the nearly 4,000 reviewers that can’t stop raving over it. So many reviewers were left speechless over how perfect this system was. One reviewer compared it to in-house dental whitening kits and even said it worked better! Similarly echoing one another, so many were just as pleased with their results and were left in awe. Another reviewer said it renewed the confidence in their smile and they happened to find themselves smiling more and more. Honestly, we love that! Not only did it bright up their smile, but it brightened up their mood, too! Other reviewers noted how amazing this product was when dealing with sensitivity. As we all know, when dealing with sensitive teeth, there is nothing more difficult than leaving products on them for long periods of time. Amazingly, so many users dealing with that same teeth sensitivity did not find any issues with this product. In fact, one reviewer loved how it didn’t cause any sensitive spots nor did it strip any of her enamel. Another reviewer claims this is the best whitening system when looking to not deal with that same grimy texture other whitening strips offer. The shoppers said this left teeth whiter and brighter without any of the added texture after rinsing. There is nothing worse than gunk left in teeth after brushing them! Above all, so many reviewers loved how easy this system was set up to be. One reviewer claims that’s the reason it’s so effective because it is so easy to use and to understand. The only thing better than an easy system? An easy system, we want to use of course! For those looking to whiten and brighten smiles in under an hour, this easy-to-use teeth whitening kit loved by nearly 4,000 other reviewers may just be it! 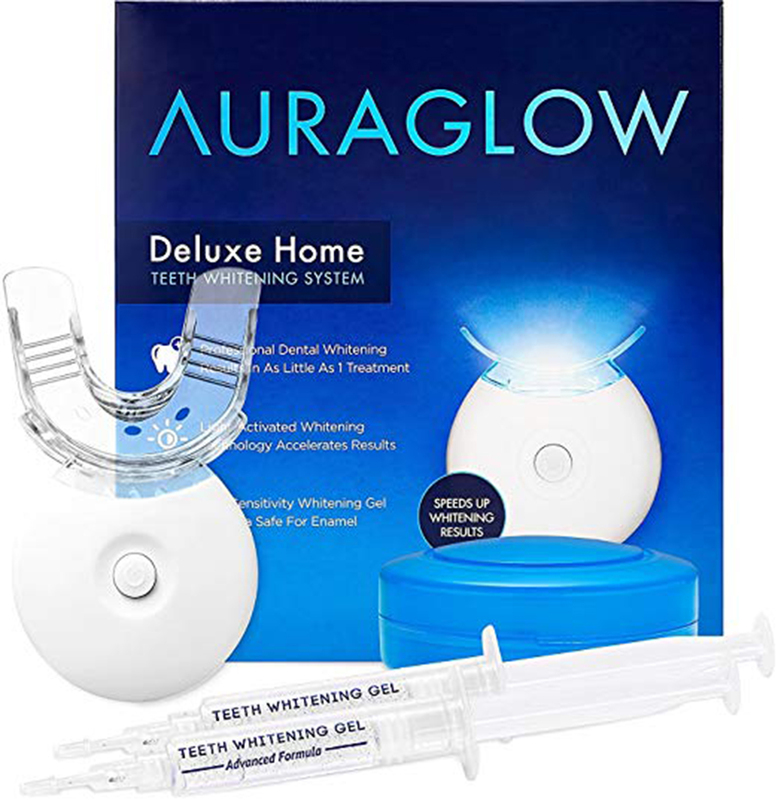 See it: Grab the AuraGlow Teeth Whitening Kit, LED Light (originally $60) now only $49, available while supplies last at Amazon! Please note, prices are accurate at the date of publication, March 24, 2019, but are subject to change. Not your style? Check out additional teeth whitening kits also available at Amazon!